Welcome to a new series of Momenta Industry Deep Dives. The goal of these efforts is to provide a deeper look at key dynamics and forces shaping the disruption of different sectors, an overview of opportunities and risks for stakeholders and critical areas of focus for the near term. We will follow our Deep Dives with shorter pieces that explore different aspects of the market evolution, and why it’s relevant. In our first Deep Dive we outline the massive disruptions coming to the energy industry: how declining costs of solar, wind and energy storage set the stage for an inflection in the balance of renewable energy globally. We also explore how the economics of electric vehicles, autonomous vehicles, and transportation as a service are poised to transform demand for energy and up-end existing cost structures. We look at risks for producers and utilities, along with opportunities – and highlight priority themes for the year ahead. The 21stCentury is characterized be accelerating change in every industry, driven by the impact of technology applied to business process, organizations, communications and economic models. The energy industry is massive, essential to economic and societal activity, and long a driver of geopolitics. Modern industrial economies need reliable sources of power for homes, cities, business, manufacturing, transportation and communications. Carbon based fuels continue to dominate the market, particularly petroleum and natural gas, but there are political, regulatory, technological and economic forces driving the rapid adoption of clean, non-carbon-based alternative energy sources - solar and wind most prominently. The World Health Organization estimates that 5 million people per day die annually from air pollution from fossil fuels. The application of advanced information technologies across the industry, from legacy extraction and production, to generation and distribution incorporating heterogeneous sources – transforms the nature of businesses and organizations, and requires new skills to address coming opportunities and risks. 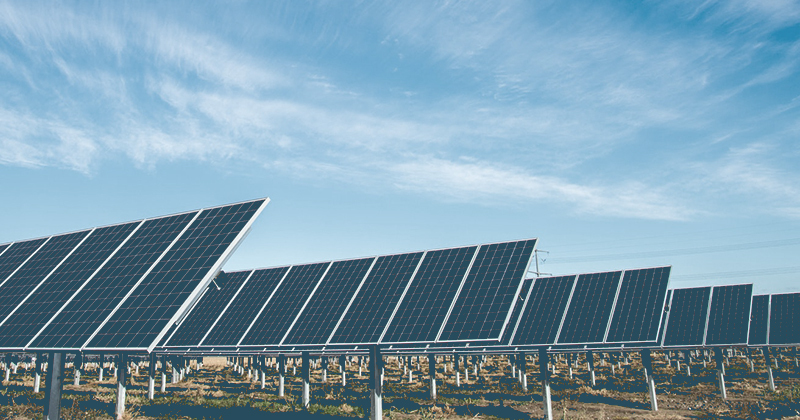 The adoption of clean tech – particularly solar generation, along with the rise of electric vehicles (EVs) has the potential to create significant disruption in the industry. There are growing proof points that solar energy is on the verge of becoming the cheapest source of power on a global basis, without any subsidies. Innovations and economies of scale in battery and other energy storage technologies pave the way for large scale adoption of utility-scale solar and electric vehicles. Author Tony Seba in his 2014 book Clean Disruption has outlined the case that that we are on the cusp of a US$12tn disruption of energy and transportation. His work suggests that the cost of solar will drop so much that by 2030 all new energy will be solar. By 2025 all new vehicles will be electric and all new vehicles will have driverless capabilities. Over time, the energy grid will become an Internet of Energy. 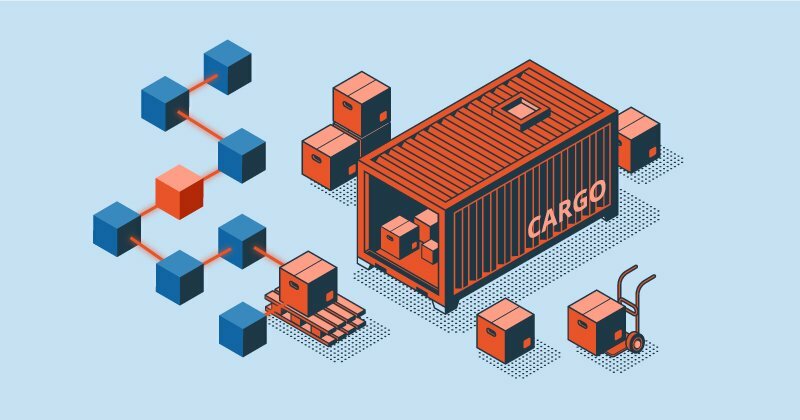 Customers will upload and download energy on the grid, with transactions likely tracked on applications running on blockchain architecture. The big shift – when do renewables become a reality? Renewable energy has been “promising” for decades, but periods of over investment coupled with high profile boondoggles particularly in the 2008-2010 period soured public perception of the space for several years. Similar to technology investment bubbles, the amount of hype vastly exceeded the reality of near term returns, but after clearing away the detritus of failed ventures the promise is compelling. The impact of a shift to clean energy generation has significant ramifications for oil and gas producers, while coal producers have already borne significant brunt of disruption. Wind, Solar and Batteries create a powerful combination for disruption. The steady declines in the cost of Solar PV, battery storage and software create a disruptive combination, as the cost per KwH for new generation for solar is becoming the cheapest source of energy in the world. In the US, new generation - either coal LNG plants can be built around $0.05-0.06 per KwH at the cheapest. In 2017, over half of new power generation built in emerging countries was renewable. Unlike other capital assets, like manufacturing or heavy equipment, clean energy technology costs are declining steadily and changing industry dynamics. The price of wind power continues to drop based on improvements in technology and manufacturing. 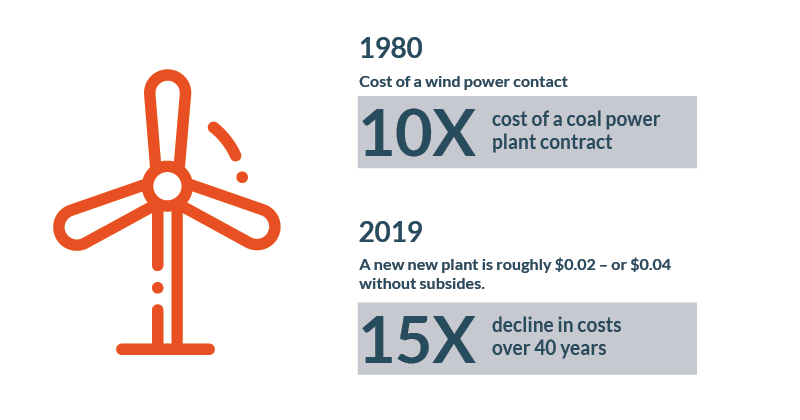 In 1980 the cost of a wind power contract was 10X the cost of a coal power plant contracts. Today a new plant is roughly $0.02 – or $0.04 without subsides. This is a 15X decline in costs over 40 years. In areas where wind is plentiful, Morocco, Brazil, Mexico have all seen wind power at less than $0.03 per KwH. Offshore wind remains expensive, but it continues to decline in cost, with the first major US offshore wind deal signed at $0.06 per KwH. Innovations such as floating turbines can drive accelerating adoption of wind power. In 1977 it cost $77 per watt for a solar panel; today the cost is less than $0.30. This rate of cost decline is equivalent to a massive digital transformation. 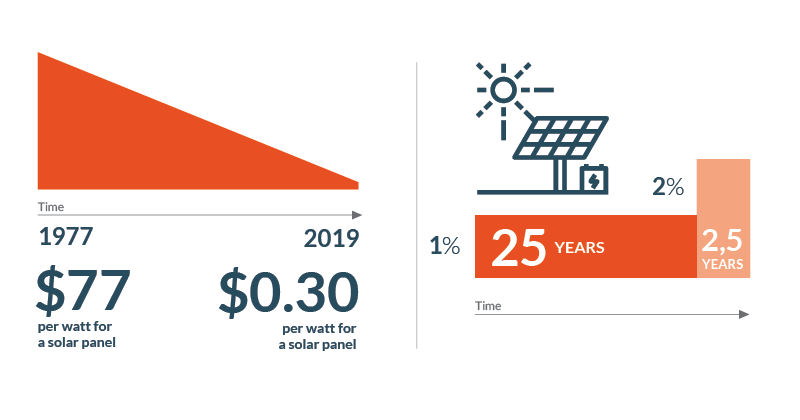 In the US, the cost of 20-year solar contracts has declined by a factor of 8 over the past decade. In sunny areas, the cost of utility scale plants without subsidies will be the cheapest form of energy in the world. Last year in Chile, a new solar installation hit $0.0215 per KwH, and there have been similarly impressive projects in Abu Dhabi and Mexico. The scale of solar has increased by a factor of 50 over the past decade – it took 25 years to get to 1% of total world electricity by only 2.5 years to get to 2%. Assuming a conservative decline in PV, the cost solar will drop by a factor of 3 over the next decade. Solar and Wind together are countercyclical – with sun shining during the day and in the summer and wind stronger at night and in the winter, the combination could deliver 70% of electricity on a continent size grid. Batteries are the key to reaching 80-90% of energy generation from renewable sources. Lithium Ion battery prices have declined by nearly 80% since 2010, with forecasters consistently underestimating the rates of decline by orders of magnitude over the past several years. Lithium Ion batteries are falling at the same rate as solar (around 20% per year), and while they are still expensive, they continue to get cheaper at a steady rate. Energy is a fungible resource; people will buy the cheapest form they can. India cancelled 14 Gigawatts of coal fired power generation in 2017 because of the falling cost of solar and the impact on coal companies has been painful. Peabody Coal in 2012 was the largest publicly traded coal company and was bankrupt by 2016. The Stowe Index of publicly traded coal companies declined 90% from its peal. Worldwide demand for coal peaked in 2013 after growing for 150 years, and while it grew slightly in 2017, it continues to decline. Oil is the most commonly traded commodity globally, but the price is highly sensitive to small changes in production and supply. Swings of 2% of supply create massive volatility in the price. Over the past decade, the conversation has shifted away permanently from concerns about peak oil production, when the world’s supply would peak– to peak oil demand, largely driven by the adoption of EVs, sharing and autonomy. Rather than being concerned that the world will run out of oil, the new concern for producers is that demand for energy will shift away from oil long before the supply declines. The key driver of shifting demand for oil will be adoption of transport as a service, autonomy of transport and electrification of transport. Transport as a Service is underway – in the US the usage of taxis peaked at 1.4 billion rides per year, but because the cost per mile of Uber and Lyft are around half a traditional taxi, in 2018 there were over 3 billion rides when sharing is included. Autonomy is also coming, Google with Waymo, GM with Cruise, and Tesla are the three leading companies targeting autonomous vehicles. 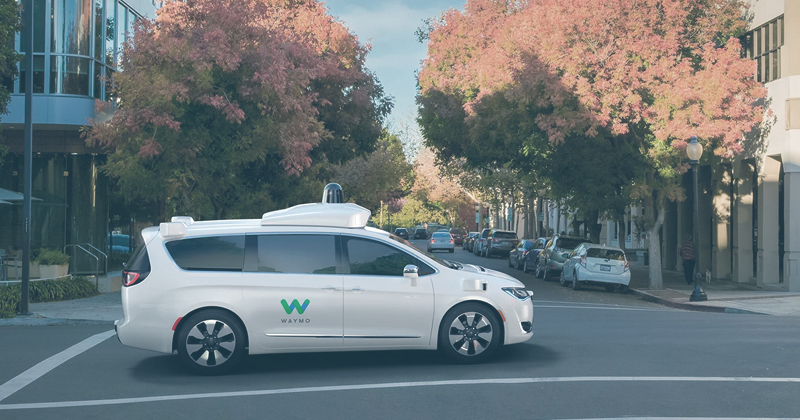 Waymo has driven well over 8 million miles and is already offering driverless taxi rides in beta in Arizona and they plan to launch a service soon. GM Cruise has driven over 5 million miles and is planning to launch a fleet of Chevy Volts with no wheels and no pedals and plan to launch a robo-taxi service this year. Tesla has driven 1.6 billion miles in its cars. According to estimates from McKinsey, half of the cost per mile of an Uber comes from the the driver, while fuel cost is around 30%. An electric autonomous vehicle will be 10X cheaper per mile than traditional oil-powered automobiles. While there are only around 3 million elective vehicles out of a billion worldwide, shipments are doubling every 18 months. Similar to forecasts for solar and batteries, the estimates for Electric Vehicle adoption continue to underestimate growth. The assembly cost of EVs is also far cheaper. Ford estimates that the cost of the final assembly area for EVs will be half the cost of traditional autos, factory capital cost will also be half, and labor hours will be 30% less. Most of the major producers will forecast peak oil within the next 15 years, with financial firm Ark Invest predicts that because of sharing, even if EVs account for 10% of total vehicles by 2025 they would account for half of total miles driven. What are the implications of disruption coming to the energy industry? Clean energy was non-competitive for years, but with the declining cost of solar, wind and battery storage, along with the rise of EVs, autonomous vehicles and transportation as a service. With the dynamics of exponential cost curves now impacting energy generation and transport, digital disruption is coming to the energy sector. 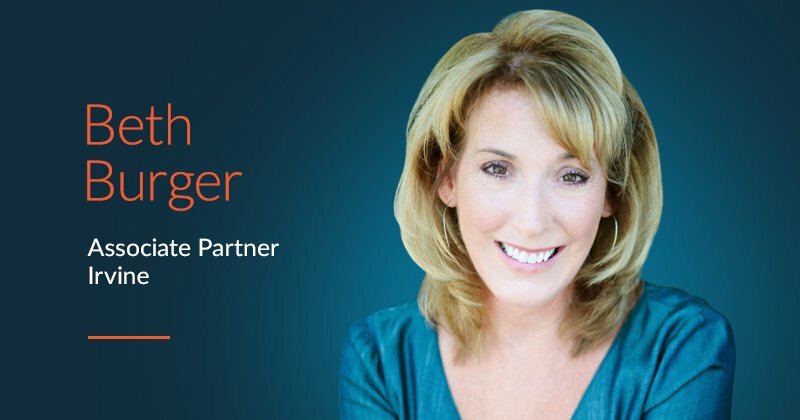 The industry will be experiencing broad-based change. The risks to the energy industry do not come solely from the substitution of different sources of energy to replace carbon-based fuel. Digitalization of generation and distribution removes traditional market frictions that allow market participants to charge economic rents; margins become fair game as low cost alternatives pressure both revenues and cost structures. What are the risks for producers? 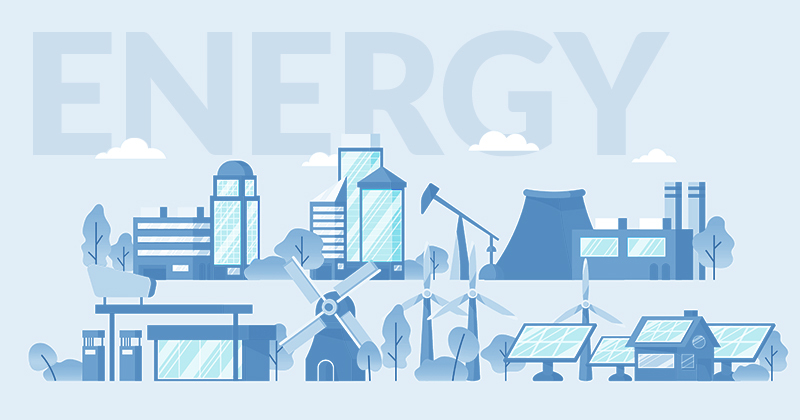 Although there will continue to be demand for oil and gas for decades, producers will need to adjust to the accelerating adoption of alternative energy into the grid and for transportation. Even though their business models are predicated on volatile prices and cyclical economic cycles, those companies in the extraction, refinancing and distribution business need to anticipate fundamental challenges to their viability. For highly capital intensive businesses with heavy reliance on debt financing, a decline in demand and commensurate crash in the price of oil could result in billions of dollars in stranded assets. Low prices could create a cash crunch impacting the ability to service debt, which could lead many producers into bankruptcy. This is not news by any means, but there are key imperatives in the near term. Producers will need to maintain their existing businesses and infrastructure while balancing opportunities to expand into more sustainable ventures. The coal industry has already experienced significant disruption as generation embraces LNG, and increasingly solar and wind. What are the risks for utilities? The challenges for utility power providers are far more complex. Utilities must navigate a thicket of regulatory constraints, along with technology challenges in managing the demands of population growth, disruptions from weather events, the maintenance of aging infrastructure, and the growing complexity of incorporating heterogenous generation sources into the grid. Working within a regulatory environment creates significant innovation constraints, despite the relative cushion provided by protected competitive markets. A growing threat comes from vulnerability to hackers, potentially state-sponsored. Connecting assets to the internet brings significant risks that are not well understood. What are the digitalization opportunities ahead? With the array of information technologies available, including every cheaper sensors, storage, processing and more powerful visualization, analysis and AI tools, the challenge ahead is less about technology choices and more about the effective application for business value. Applying information technology to traditional industrial technologies opens up the potential to enable new types of business models, to serve customers better and to leverage existing relationships and expertise with the application of technology. distributors and utilities alike, there are massive opportunities to improve asset utilization, reduce downtimes, reduce risk, optimize business processes and improve customer satisfaction. 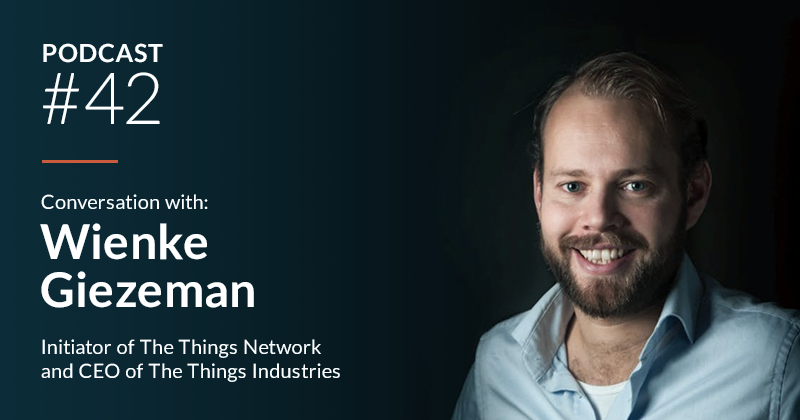 The “killer apps” of digitalization in the industrial sector is predictive maintenance, where by instrumenting physical assets, collecting historical data on performance and downtime that can be used to develop predictive algorithms – reducing cost of equipment outages, lowering the expenses of unplanned repairs and maintenance, and ultimately reducing cost and extending the life of capital assets. promising upstream opportunities lie in optimizing the ability to extract resources through the use of advanced analytics and AI, driving more effective exploration, drilling, recovery as well as monitoring for methane emissions, safety and potential spills. the vision of a future grid that will integrate multiple, heterogeneous sources of generation including renewal sources, that will accommodate both dynamic production and delivery of energy – will require enormous efforts to engineer and execute. With the digitalization of power assets, there are opportunities to reduce the costs of maintenance, increase operational efficiency, reduce the cost of investments while extending the useful life of assets, decrease the consumption of fuel and lower emissions and reduce planned and unplanned outages. This reduces cost of equipment outages, lowering the expenses of unplanned repairs and maintenance. This ultimately reduces the cost and extends the life of capital assets. monitoring for methane emissions, safety and potential spills. For utilities, the vision of a future grid that will integrate multiple, heterogeneous sources of generation including renewal sources, that will accommodate both dynamic production and delivery of energy – will require enormous efforts to engineer and execute. lower emissions and reduce planned and unplanned outages. The digitalization of the electric grid lays the groundwork for the ability to interconnect systems across regions, to provide greater resiliency against outages and cyber attacks, while supporting the multi-directional flow of electrons and value across distributed networks of producers and consumers. While the long-term vision for the Internet of Energy will take years to realize, it’s essential to lay the groundwork today. There’s no way to predict what will happen with geopolitical events or natural disasters, and while the financial markets swooned in 2018, the New Year is off to an encouraging start. 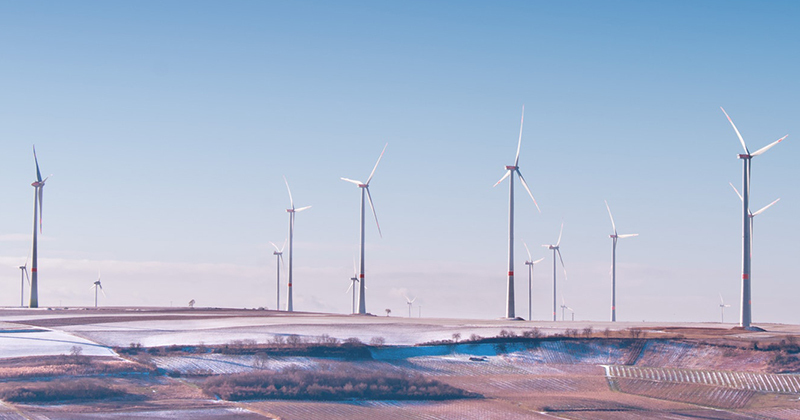 The clean tech industry needs to face the impact of subsidies going away, particularly around wind power, so focus on cost structures is critical to ensure economic viability. For the oil and gas industry, an economic slowdown could further dampen prices, creating additional pressures to leverage analytics and AI to optimize operations and preserve assets. With growing long-term local mandates to implement clean power, utilities will need to plan carefully for the transition to a next generation grid, while ensuring existing assets remain resilient and available. The strong labor market presents challenges to incumbents who must compete for talent with high-growth tech companies and startups – and in many cases cultural change needs to occur to support new paradigms in the industry. We’re optimistic about the potential that digital transformation holds in delivering essential fuel and power to the global economic engine. At the start of 2019 we’re at the cusp of a massive shift, but the pace of change will continue to be governed by regulatory structures, organizational inertia, incumbent competitive dynamics and the vast interdepencies between transportation, industry, energy and government. Is the energy industry up to the tasks at hand? 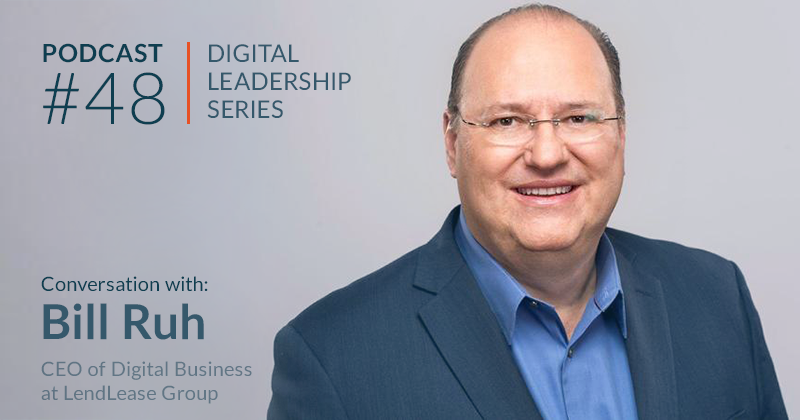 Yes, but success in the digital age comes from collaboration and sharing best practices – not executing in silos. We look for winners to lead with vision and mastery of the technology, but above all to bring a new digital culture to the fore.